This project aims at reducing pollution in the Baltic Sea and protecting biodiversity by implementing concrete and sustainable actions in cooperation with local communities in Lithuania. The project focuses on finding solutions to reduce the input of pollutants from rivers into the Baltic Sea and decreasing poaching activities of salmon. In order to improve the ecological stability of this ecosystem, illegal wastewater spills in private households are identified with the help of volunteers and eco-friendly low-cost alternatives for wastewater treatment will be devised. The project will further help educate local communities and fishermen about the harmful consequences of poaching on the environment and its biodiversity. Baltic salmon usually inhabit marine waters and return to spawn in native freshwater streams. During migration these fish often swim hundreds of kilometres, thereby encountering a variety of different environments during their lives. In Lithuania, illegal fishing activities greatly increase during the annual salmon migration period. Intensive poaching constitutes the main threat to salmon populations of this region. Lithuanian salmon is considered a profitable catch and is often sold on the black market. However, illegal fishing is also considered a local tradition, further contributing to the problem. Residents, particularly those living in villages near rivers, cause a great deal of damage to the existent salmon population by using illegal fishing nets and poaching at prohibited times. Untreated wastewater, one of the major factors contributing to the pollution of the Baltic Sea, also has negative effects on the salmon population. The major sources of this pollution include the surplus of synthetic or chemical fertilizers and untreated domestic sewage water, both of which enter the Baltic Sea via rivers. Unfortunately, the release of untreated wastewater from households and farms directly into rivers and streams is common practice in Lithuania. The project commenced with the circulation of awareness-raising material on social media platforms. A video demonstrating the beauty of the Baltic Sea’s coastline and the Lithuanian landscape was produced, along with informative material on critical issues affecting this region, including pollution and its effects on human beings and fish species. 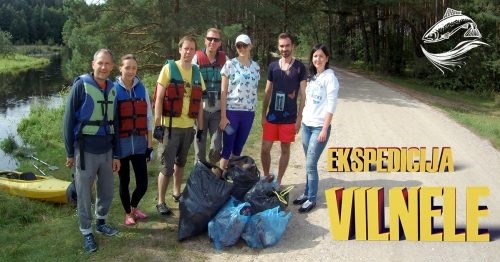 Furthermore, volunteers and environmental activists working for “In Actio” have begun tackling the problem of salmon poaching and the reduction of pollution in Lithuanian rivers. “In Actio” is also closely cooperating with Lithuanian environmental inspectors, who help organise precautionary raids against infringers.